You are here: HomenextToursnextPersonal tours from My Brighton exhibit, 1994nextArchitect's tournextWhat a disaster! What a disaster as a shopping centre! How unattractive, how barren and out of character with the style of Brighton! 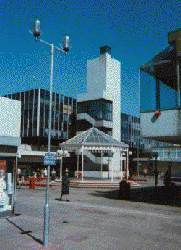 The folly or innocence of the bandstand, with bands playing music, to try and attract people to the shops. What happens in the winter when it’s raining? Who would come to see a band when a gale is blowing through the square? And boy, did gales whip around that place! You’d have thought that even in the 1960s architects would have been able to study / predict the effects of the various environmental forces on their design. Or was it just about something “pretty” that made them a lot of money?